Now it’s easy to order your own professionally-printed photos, photo book, canvas print, or calendar for your grandma right from inside Zoner Photo Studio. Order your photo products in just a few clicks—soon they’ll be bringing joy to you or your loved ones. You don’t need to learn to use a new program. Create your photo products right from inside Zoner Photo Studio. 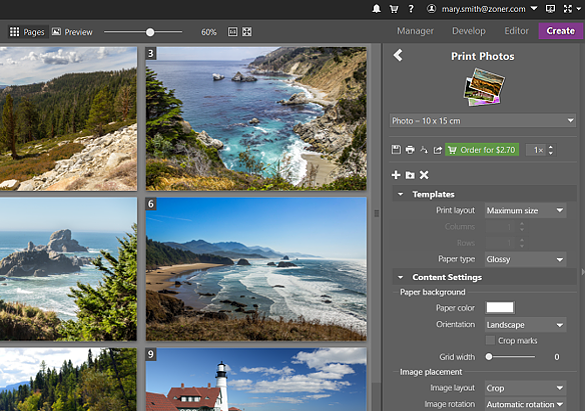 We’ve built the new Create module to make the whole process of preparing and ordering photo products easy. Printed photos, photo books, canvas prints, and calendars will delight everyone around you. You can create your items using different photos for each recipient so that they all receive personalized gifts. We produce all of our photo items at professional photo printers in high resolution and with thorough quality control. That ensures you’ll be glad to show off every photo item you create. You will find more information about the quality of printing while ordering your photo product (right inside the program). Creating a printed photo, book, canvas print, or calendar with your own photos in Zoner Photo Studio X is a snap. Try it for your first month free! How much do our photo products cost? Photo products are being processed immediately after you finish your purchase, so that they can be shipped to you as soon as possible. The delivery time varies according to the delivery address and to the chosen photo product. All prices are inclusive of any VAT/sales tax. You can pay using Paypal or your credit card. Our photo products are produced by 24print, an expert in the production of photo gifts.